The Transfer Pricing and Intellectual Property course addresses intangibles from the complementary perspectives of Transfer Pricing and valuation. The course provides a framework in order to capture the various characteristics of Intellectual Property and discusses the methods that have been provided by the OECD to establish arms length pricing or valuation of intra-group transactions of Intellectual Property, as well as the practical implementation of these methods. A fee reduction is offered for I3PM members from the € 1,980 list price. Monthly, including 19 July, and 16 August 2018. For more information, please see http://www.imfacademy.com/newsletters/2018/01/8830.php?r=322038555, or request a brochure via IMF's website or send an e-mail to info@imfacademy.com. Cost : A fee reduction is offered for I3PM members from the list price. When : April, May, June 2018. To register : To subscribe please email service@forum-institut.com or fax +49-6221-500-555. I3PM Advisory Board identifies hot IP research topics – we are looking for a team to set up corresponding research projects. If you are interested to participate – please contact Bent Lundsager (Chairman of the I3PM meets Academia Workgroup). I3PM-CEIPI-BETA Conference - Strasbourg 4 May, 2017: on "IP Management challenges arising from pervasive digitalization"
The second “I3PM meets academia” conference was again organized by I3PM in cooperation with its academic partners CEIPI and BETA. Video Stream of „I3PM meets Academia“ conference 2017 now available! 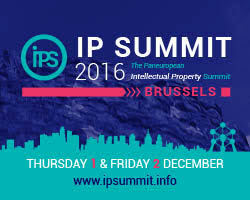 Since 2004, The IP Summit is the unrivalled platform dealing with all IP-related issues in Europe. For its 11th edition, on 1st and 2nd December 2016, Premier Cercle™ will gather 100+ IP high-level speakers and 450+ delegates from corporate, private, institutional and academic worlds at the Pan-European Intellectual Property Summit (IP Summit) in Brussels. This two-day conference aims at discussing trademark, patent, trade secrets, copyright and design major recent evolutions, actions, issues and ongoing EU Reforms. Since 2006 the MIPLM programm educates IP Management skills to IP Experts from all over the world. 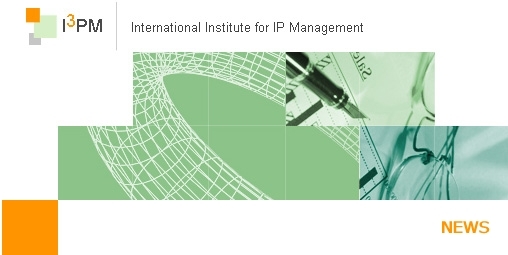 There is a growing and developing best practice in business orientated IP Management. The Executive IP Management Days were developed to meet these requirements and are held for the first time in Strasbourg in October. The Executive IP Management Days aims to provide insight to specific aspects of IP strategy development, practical issues in systematic synthetic invention, IP protection of perceived customer benefits and sustainable organizational change in companies. The workshop program is mainly addressed to IP professionals, but also open for graduate students who are interested in these topics and is dedicated to train IP management executives in industry and institutions. The framework is also designed for inspired discussions and networking. 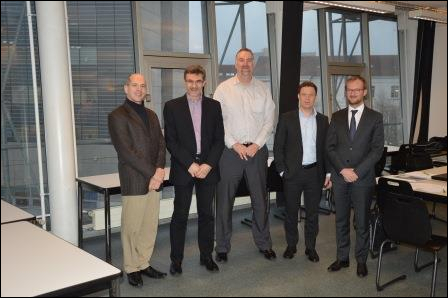 The first face-to-face I3PM Advisory Board meeting took place on January 13, 2016 at the CEIPI Institute of the University of Strasbourg. The I3PM Advisory Board is a new body of I3PM. The I3PM Advisory Board members come from industry and academia and will establish an ongoing communication between industry and academia in the field of IP management. One goal is to identify current IP management issues in various industries and channel corresponding research questions to academic institutions being active in this field. This way it is expected that solutions of practical relevance will be developed which can then be provided to IP managers. The current I3PM Advisory Board members are: Brian Hinman (Phillips), Peter Bittner (I3PM), Bo Heiden (University of Gothenburg), Thibaud Lelong (CEIPI), and Udo Meyer (BASF - not on the picture). The first meeting was supported also by Bent Lundsager (I3PM - second from right) who is chairman of the "I3PM meets academia" initiative. 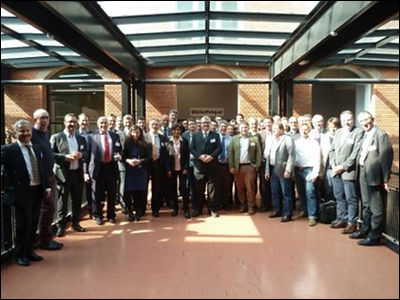 The I3PM association, together with the CEIPI and BETA (Bureau for Economic Theory and Applications, a research laboratory of the University of Strasbourg, University of Lorraine and the French National Centre for Scientific Research CNRS), organized on March 23, 2015 in Strasbourg a Conference on the “IP Management Challenges in Open Innovation Environments”. This conference was considered as a big success and is part of the initiative “I3PM meets academia”, which I3PM wishes to develop further in the next years. Further information as well as pictures of the event, summaries and full presentations is available via the following link. The President of I3PM, Peter Bittner, participated actively in a panel discussion at the Eurobrand Forum 2014, which took place in Vienna. This conference, organized by the European Brand Institute, in cooperation with the US Embassy, focused in 2014 on Innovation & Trademarks. Further information, including a picture of the panelists is available via the following internet link. The MIPLM Course 2014/2015, organized by the CEIPI, has started in January 2015 and will end in June 2015. Information on this Course, offered yearly since 2006/2007, can be seen via the internet Link below. A new CEIPI/WIPO/INPI program is proposed from 15-26 June 2015 on Technology Transfer (TT) and Licensing. This highly intensive course will mostly address practical issues relating2 to TT, in conjunction with a number of theoretical sessions. Further information can be found via the internet link below. The IP Valuation Final Report from the Expert Group, drafted for the European Commission, DG Research and Innovation, is available via the internet link below. The report addresses amongst the topics of IP valuation approaches, methods and standards, IP valuation in the context of raising finance, IP valuation and accounting and reporting, IP valuation in litigation. It further proposes policy actions to monitor IP transactions and IP valuation practices and to facilitate IP secured lending and introduce an additional reporting section for IP. European Master of Intellectual Property Law and Management - From IP Expert to IP Manager (2015 session) – Time schedule and details. Its ultimate objective is to qualify experienced IP professionals to act as IP managers with the practical skills and knowledge to deal with the new challenges of value creation. Successful participants will be awarded the academic degree Master of Intellectual Property Law and Management (MIPLM) by the President of the University of Strasbourg, which can be considered a prerequisite for a doctoral thesis (depending on the requirements of the university where admission is being sought). The eurobrand forum was organized in Vienna in cooperation with the US Embassy and gathers international trademark experts and decision makers to discuss about the future of trademarks regarding their creation, management and organisation for sustainable value creation. Peter Bittner, president of I3PM, was invited as a speaker in the panel: Innovations turn into brands – the potential of IP rights for innovations, IP rights as assets. The 7th session of the PCT WG took place in Geneva, from 10.06.2014 to 13.06.2014. The working documents and the ‘Summary by the Chair’ are available on the WIPO website at http://www.wipo.int/meetings/en/details.jsp?meeting_id=32424. It was announced that HU, CZ, SK and PL are working towards the establishment of a new PCT International Authority. The question of whether an international application could claim the priority of an earlier application with the same filing date as the international application (for incorporation by reference of missing parts), the WG agreed to discuss the matter at its next session with a view to providing an opinion on the matter for consideration by the Paris Union Assembly as the competent decision-making body. Also discussed were national phase entry using ePCT and expanding the right to practice before RO/IB. The eighth session of the Working Group is tentatively scheduled to be held in Geneva in May/June 2015. European Master of Intellectual Property Law and Management - From IP Expert to IP Manager (2015 session). In January 2015, the ninth consecutive Master of IP Law and Management (MIPLM) will start at CEIPI in Strasbourg. Participants from all across Europe with different professional backgrounds have successfully completed their studies with us. This European master’s program was designed especially for experienced IP professionals (three years in the IP field) as well as European patent attorneys and lawyers. Its ultimate objective is to qualify experienced IP professionals to act as IP managers with the practical skills and knowledge to deal with the new challenges of wealth creation and profit generation. Participants acquire first and foremost a new understanding of how intellectual property works in business models and are conveyed the necessary skills to achieve the systematic alignment of IP management and business objectives. The course provides an international networking platform for IP managers and in addition enables participants to build long-lasting relationships and to further develop relevant topics within the field of IP management. Being part of this international alumni network also offers new job opportunities and publication possibilities. The program combines legal, economic and management studies and includes lectures from leading scholars and experienced practitioners in the field of IP law and management. Due to the extensive network of lecturers in academia and industry, the MIPLM is able to continually relay the latest topics to its participants. The part-time training comprises a period of six months with monthly one-week long lectures. Successful participants will be awarded the academic degree Master of Intellectual Property Law and Management (MIPLM) by the President of the University of Strasbourg, which can be considered a prerequisite for a doctoral thesis (depending on the requirements of the university where admission is being sought). Please find an online brochure with detailed information regarding the course curriculum and admission standards as well as frequently asked questions under http//www.ceipi.edu/index.php?id=5478&L=2 or http://www.sti-ipm.de. I3PM has obtained the status of Permanent Observer at the WIPO in December 2013 and is listed under the International Non-Governmental Organizations WIPO members NGO_INT. More information with respect to what this means can be found at the WIPO internet page WIPO Observers. In January 2014, the eighth consecutive Master of IP Law and Management (MIPLM) startet at CEIPI in Strasbourg. Participants from all across Europe with different professional backgrounds have successfully completed their studies with us. This European master’s program was designed especially for experienced IP professionals (three years in the IP field) as well as European patent attorneys and lawyers. Its ultimate objective is to qualify experienced IP professionals to act as IP managers with the practical skills and knowledge to deal with the new challenges of wealth creation and profit generation. Participants acquire first and foremost a new understanding of how intellectual property works in business models and are conveyed the necessary skills to achieve the systematic alignment of IP management and business objectives. Please find an online brochure with detailed information regarding course curriculum, timetable, admission standards, as well as the application form and frequently asked questions under www.ceipi.edu/index.php?id=5478&L=2 or http://www.sti-ipm.de. We would be very happy to meet you in Strasbourg. In this article, published in the German CHIP Magazine, issue 08/2012, Peter Bittner strongly criticizes some statements and the position of German’s former Pirate political group leader Ms Weisband, which negates the obtention of Property Rights on Intangible Assets. This article is available on our Website via the link Piraten vs. Eigentum: Den Zeitgeist verpasst. Unfortunately it is only available in German language. I3PM publication – Peter Bittner and Matthias Zahn: IP Management in the Software Industry – Who owns the knowledge? This first of a series of articles deals with the topic “Who owns the knowledge?” IP Management in the Software Industry: Who owns the knowledge? There are numerous book reviews available without access restriction on our Website. Many thanks to the reviewers for their contribution, and special thanks to Gordan Hyland. Follow I3PM on Linkedin or join the I3PM community Linkedin Group! Subscribe to the free Public I3PM-Newsletter!